In my first teacher training, we, of course, had to study the Yoga Sutras. I think it was in our first weekend (we came together for long weekends every other month) we were assigned to begin reading this for the next weekend. So I went home, and opened up my copy. 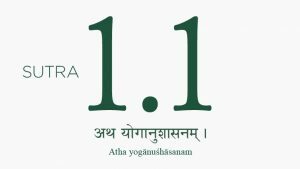 Sutra 1.1: Atha Yoga Anusasanam, or Now begins the authoritative instruction of yoga or Now begins the Study of Yoga. Wow. Blew my socks off. I couldn’t get past this one. Now – Atha. So this word in Sanskrit carries some meaning. It is used to imply that you are prepared and have been deemed prepared by the teacher. At that time, I wasn’t so sure that I was really prepared. Had I been doing yoga long enough? Was I really serious enough? I was hesitant and a bit taken back by this very first sutra. Another angle as I studied it, took me to the feeling of, well, Now, as in the Eckart Tolle kind of Now. Like, Be Here Now. As in, show up present for your practice every time you come to the mat, Now. Did I have that presence? Was I comparing myself to yesterday, or worried about what I would be able to accomplish by tomorrow. Well, then, I certainly wasn’t in the Now this sutra implied I needed to be to study it. Had this teacher really decided I was worthy, or was she merely trying to fill her Teacher Training? It took me about a month of sitting with this sutra. It is still something that I ritually say to myself each day on my mat as I begin my practice. This sutra still invokes a seriousness, a letting go of what has been in my mind before that moment, so that I can meet myself with appropriate presence, honoring this art and science I am about to practice. I actually probably make a bigger deal about this first sutra than most people because of the impact it had on me. I think the first sutra was when I realized that I will never lack for something to learn about yoga. 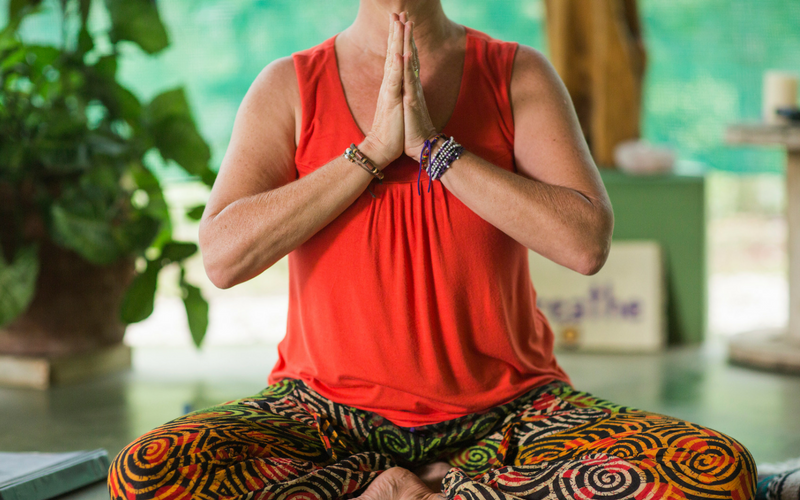 Being open, moment to moment to life really is my yoga in a nutshell. And I have to thank Patanjali (if he was a one person) for that! There is something about the vibration of Sanskrit words that I do feel creates change within me. Yes, I can look up the translations of mantras. There is nothing like the lasting vibration of chanting or singing some of them though. I feel so connected with yogis around the world when I chant the Gayatri at sunrise or the Maha Mrityunjaya at sunset. It’s a beautiful, unifying feeling. It’s yoga, for sure. I went through a thankfully brief period a couple years ago of waking up around 1 – 2am wide awake. So I just started silently chanting OM over and over on those nights. I did not always fall asleep shortly (though sometimes I did), but it made staying awake much more joyful, and I found that I didn’t feel tired or grumpy the next day. My big tip for anyone who has one of those sleepless nights!